I am pleased to announce that I will be joining Edi Finamore with Spain Adventures leading a photography tour to Valencia, Spain for the Las Fallas Festival March 14th to the 21st, 2012. Photography workshops are included and the tour is for all levels. Las Fallas is one of the most unique and exciting festivals in all of Europe. It is a spectacular celebration of local tradition which takes place in the form of an incredible street party. Enormous sculptural compositions, elaborate traditional gowns, music, fireworks and fantastic nightlife are part of the party that lasts for days. Plan to be there with us to capture it all! It began as feast day for St. Joseph, patron saint to carpenters, and has evolved into a month long event that culminates in a five day art, food, and entertainment filled street-party celebration that ends in a frenzy of fire and fireworks. 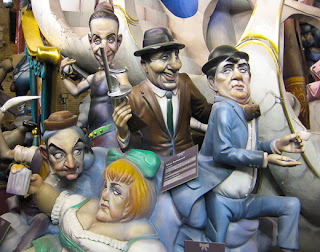 During the year, hundreds of Valencian communities construct the colorful and artistic fallas and ninots sculptures. The sculptures are ephemeral, ornamental, and satirical symbols of humorous, social, or political comment. The very large sculptures are human, animal, or vegetable in form, portraying a critique of a local, national, or international incident, personality, or character. On the 15th of March, the sculptures get placed around the City of Valencia and the city explodes with festivities. Each day begins with a desperta, which is the traditional firecracker wake-up call signaling the beginning of another day filled with excitement. The streets teem with colorful flowers and every food stand through-out the city beckons to you with buñuelos and rosquilletas from morning until the wee hours. Every day there is the mascletá that occurs in the Plaza Ayuntamiento at 2pm. String-lined fireworks are ignited to thunderous rhythmic sounds emanating a primal beat felt throughout the area. An important event is the Ofrenda de Flores a la Virgen de los Desamparados, a very beautiful ceremony on March 17 and 18 that honors Valencia’s patron Virgin. Members of the Fallas arrive from around Valencia and take to the streets wearing intricately decorated costumes winding their way to the square. The flowers they carry placed at the base of the enormous statue of The Virgin and are then put into place by men who climb the structure filling her gown. The closing ceremonial burning on the 19th, when all the fallas and ninots are reduced to ashes is known as La Crema. Beginning in the early evening, hidden holes in the statues are stuffed with fireworks. The crowds get bigger and more excited. In the streets are dancers and entertainers. The city's streetlamps are all turned off and beginning around midnight, the fallas and ninots are set on fire. An incredible barrage of fireworks is launched in to the air above the Valencia as a grand finale. For more detailed information, please CLICK HERE to visit my website. For information on Spain Adventures, please CLICK HERE.